Maintenance and cleaning of retention and detention ponds, fire ponds, pump houses and other commercial and industrial reservoirs. Retention ponds in commercial settings tend to fill up with debris pretty quickly. This leads to less volume capacity as well as weed and algae growth. Most retention ponds aren’t easily accessible by heavy equipment. 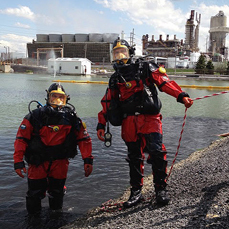 Our solution: Our HAZWOPER Certified divers can easily access your pond and use suction pumps to remove the sediment. The sediment is suctioned out to a geotextile container where it can dry. The sediment can be hauled away, but even better, it can be used as landscaping material or simply graded out and reseeded with grass. Our dive team is fully HAZWOPER (Hazardous Waste Operations and Emergency Response Standard) certified as defined by OSHA. 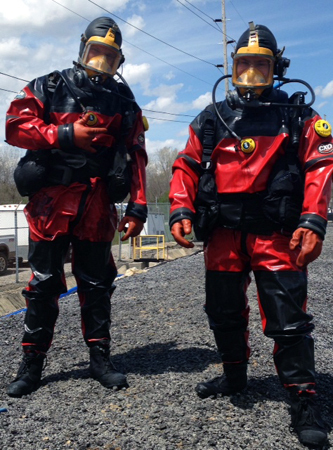 Our haz-mat trained divers are experts at handling hazardous materials and receive refresher training annually. 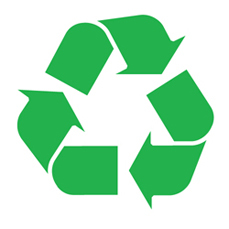 We can also work with environmental services to make sure that all EPA regulations are followed. Fire ponds and pump houses collect sediment over time. 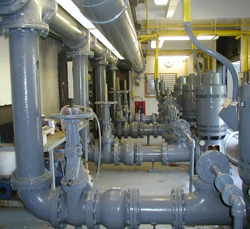 This can eventually clog the pumps and sprinkler systems, leading to costly repairs. Our revolutionary system allows divers to expertly suction the sediment lying at the bottom of the pump houses floor. In most cases, fire protection ponds aren’t allowed to be drained. This rules out commercial dredging. Our suction pump solution is the answer. Reduce expensive sediment hauling costs. The price of hauling wet sludge can be exorbitant. We vacuum sediment out into our geotextile containers. These containers allow the sediment to be used as landscaping material or graded in place with grass seed added on your property. Alternatively the sediment can then be hauled away once it has dried. Hauling away this dry sediment is much less expensive than hauling it wet. A pond cleaning system that doesn't destroy pond liners. Ponds with liners also experience sedimentation. The problem is that dredging options for lined pond owners is severely limited. 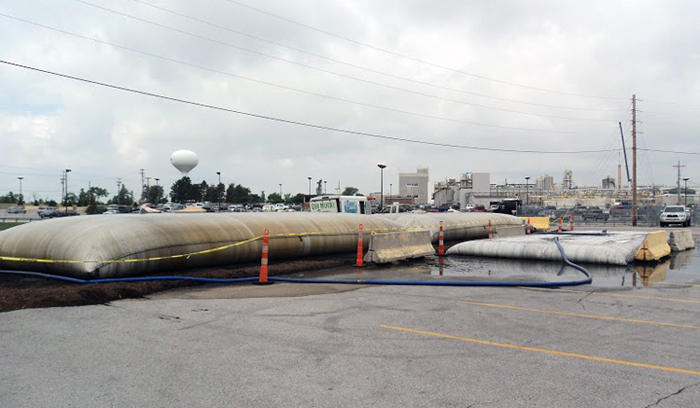 Conventional dredging and excavation equipment simply cannot remove sediment without damaging the pond liner. Our solution causes no damage to your pond liner. Our expert, environmentally certified, divers will vacuum sediment out, leaving the pond liner intact. Also known as dewatering bags or silt containers, they contain the muck and water pumped out of your pond. The fabric allows water to seep out, but not sediment. Geotextile containers are usually placed in a remote or unused location where sediment is allowed to dry. Sediment can then be used as landscaping material or simply graded in place with grass seed added. Even if you want to haul the sediment away, it can be done at a mere fraction of the cost of wet material. Geotextile containers are a big part of how we help you maintain a clean, beautiful pond.